If you want to become an engineer, no matter which, you will have to take an Engineering College Admission Test (ECAT). This test is necessary to get admission in any reputable engineering institute of the country. It is a tool to measure the competency of intermediate students who wish to become future engineers. Unlike MDCAT, there are two types of groups in prerequisite test of engineering colleges and universities. There is a difference of a subject for both pre engineering and intermediate in computer science students. Test takers attempt multiple choice questions (MCQs) based on Physics, English, Mathematics, Computer Science or Chemistry. Which bodies conduct engineering college test? In Punjab province, this test is organized by University of Engineering and Technology, aka UET, every year. Education Testing and Evaluation Agency (ETEA) of Khyber Pakhtunkhwa is responsible to conduct pre admission test for future engineers. 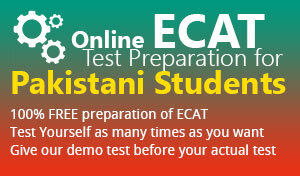 After the regulation in Sindh, National Testing Service (NTS) organizes ECAT in the province. Those who are willing to enroll in engineering universities must have to appear in this exam. HEC ETC conducts pre admission test for engineering universities in Balochistan. Pakistan Institute of Engineering and Applied Sciences, also known as PIEAS, conducts its own admission test for prospective students. Those students who want to seek admission in National University of Science and Technology, NUST, will have to appear in NET test conducted by the university. Just as PIEAS and NUST, this institute also organizes its own pre admission test. Students who have secured 60% marks in their matriculation and intermediate are eligible to take an engineering college test. The admission in engineering programs depends upon the marks obtained in pre admission test, SSC and HSSC. What would be the syllabus of entry test for BS bio medical engineering in NUST? study me kissi subject ki koi video nahe hai ku ?? Worried About ECAT/MCAT Preparation ?